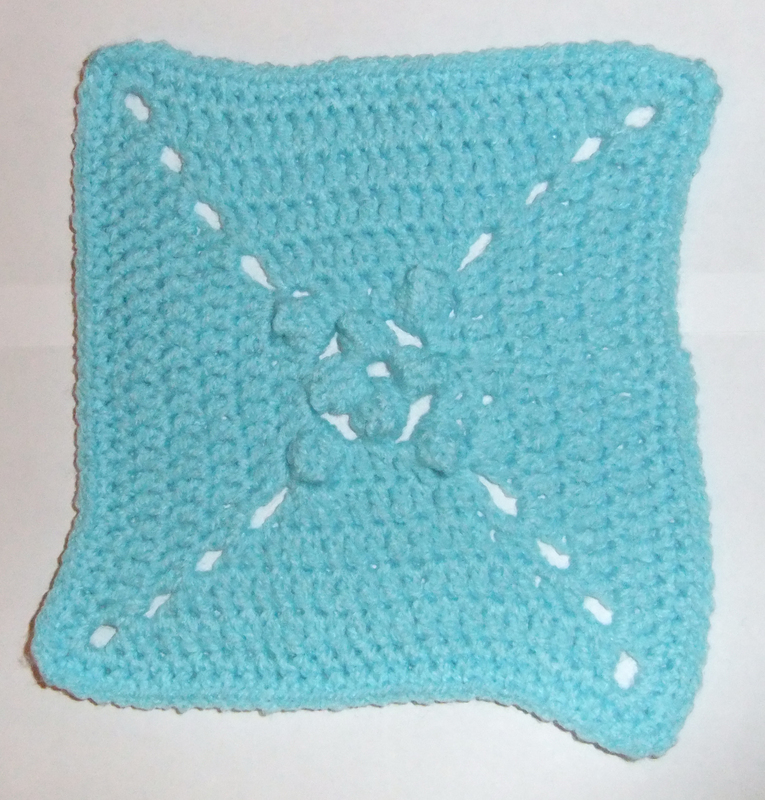 I wanted to do a square that would be quick to make and even though this one did contain several popcorn stitches it was easy to do. 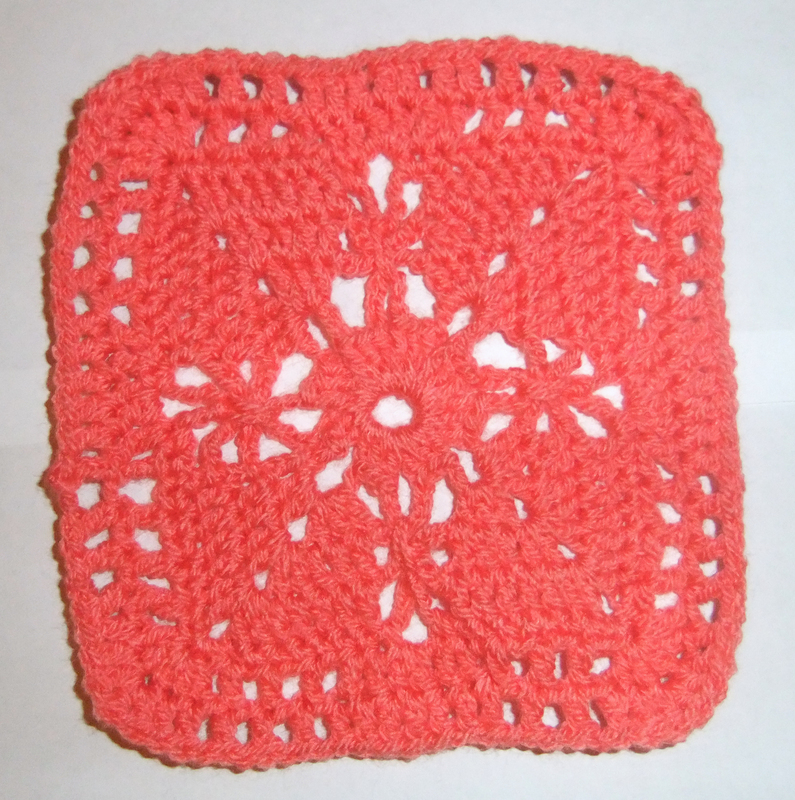 With a name like Seville I chose to do this square in a gorgeous warm pink yarn. This square was quite unusual in that in a couple of the rounds there were long chains that were then later gathered up by doing a dc in a later round. The effect is striking in the ‘starbursts’ visible in each quarter of the square. As I’m nearing the end of the project I’m now starting to think out what I’ll do with the finished squares and top of the options is a blanket. With the 18 squares I’ve published so far I thought I’d see what they all look like together. I’m so exited when I see it all laid out like this, it really is so colourful. I have to say that I do prefer making squares in the round (when the above squares are properly blocked I hope that they will look so much neater) as I have problems with with the tension when doing rows , I suppose this is something that improves with experience. 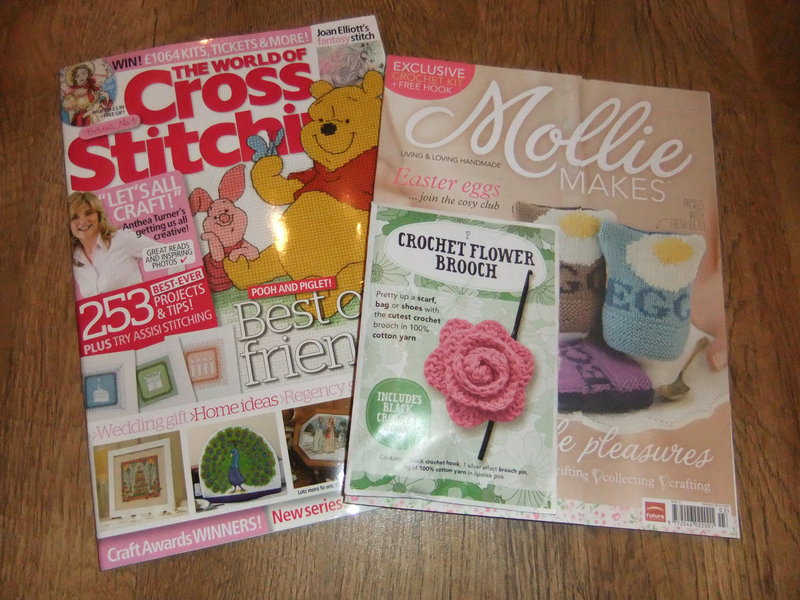 Regarding other crafty news I received my World of Cross Stitching magazine subscription today so along with the Mollie Makes magazine I bought the other day I’m going to put my feet up and be inspired! Seeing them all together IS exciting! Keep on working on your tension- it gets so much easier! 🙂 Your squares would look great as a blanket. Which is your favourite square? I like the Danish square and the Seville square. I’ve got some lovely squares I still have to photograph and post so some of those are my favourite too. Ha ha 😀 I never thought of ‘Seville Orange’, I was thinking of the place. PS which prog did you use for the mosaic? The easiest way I could do it was to copy each jpeg to a word document then shrink them to about 1″ square. Once they were all lined up I selected all, copied and then pasted it into a blank jpeg in Photoshop Elements. This then was saved as a jpeg photo. My poor wee laptop did struggle having 18 big photos all opened at once. Sounds tricky! Looks good though. I love the Seville square! That would be beautiful for so many things from curtains to scarves or even a poncho! You might want to try adding a black (or some other neutral) color to all your squares and then see how they look together. It can really pull the piece together. What a progress! They look amazing!